- Bake the small potatoes for 20 minutes. Boil the beans, pour into a colander, rinse thoroughly under cold water, then drain well. - Line a large shallow bowl with the lettuce leaves. 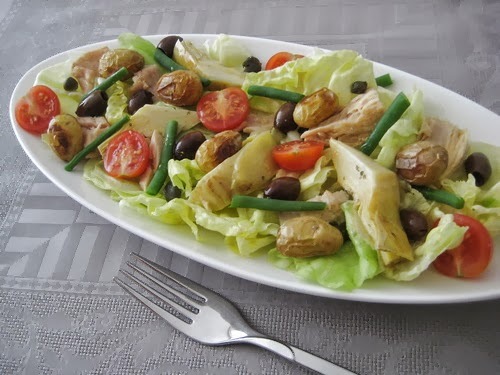 Arrange the potatoes, beans, tomatoes, tuna, olives and artichoke hearts on the lettuce, then scatter capers over the top. - Whisk together the vinegar, mustard, salt and some pepper in a small bowl until smooth. Continue whisking and add the oil in a fine stream, until the dressing thickens slightly. Pour the dressing over the salad and serve.